Hello, friends! Welcome to my stop on the Bunnies and Cream Blog Tour. Thank you for stopping by! I’ve been head over heels for this precious collection ever since I first saw a peek of it from the talented creator, Lauren Nash. Bunnies and Cream is Lauren’s debut collection for Penny Rose Fabrics and it couldn’t be any sweeter. If you missed my earlier post when I first received the fabric – you’ll want to take a look at all the darling prints in this line (it’s really special and sooo hoard worthy!!). What a delight it’s been playing with this charming collection. The details and illustrations Lauren created hit straight to my heart, and they are a sweet reminder to me of those early days with my babies. 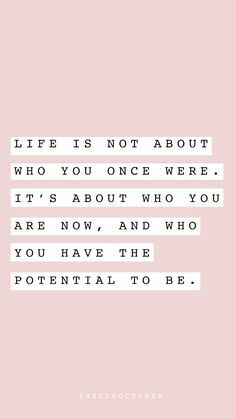 This line is perfect for little ones (ok who am I kidding … and I love it for grown girls like me, too!). The bunnies, sweet florals and strawberries had me dreaming of springtime and Easter. So I decided to create something for my children and the little ones in my life to enjoy, and to decorate our home for spring. The darling illustrations on this main print remind me of scenes inside mama bunny’s house. Playful baby bunnies eating cookies from a cookie jar ( I melt!) while mama bunny tends to the making and baking around them. I decided to create a little bunny house wall quilt around these illustrations. And my children love little treasures and surprises, so I created pockets for each “room” to hide little notes and treats for them. I made paper bunnies to fill the pockets with messages along with teeny bunny-size cards in envelopes to leave my children mail. Bunnies and Cream is full of precious imagery that lights up my fussy-cutting-heart. The fabric illustrations make perfect little stamps and labels for sewing projects and for my bunny-size envelopes, too. And the fabric added a soft touch to coordinating envelope liners! And yes *smirk … those are fabric aprons on the paper bunnies. They’re dressed in their Sunday best! My kids hovered around to take in all the details, and we made plans for creating a stash of mini cards and envelopes for Easter surprises soon. The charming details in this collection are a child’s dream! My head was swirling with ideas on things to make for the little ones in my life. I decide on one of my favorite things for gift giving – handmade bibs. I madly adore peter pan collars on pretty much anything. So I designed a pattern for a simple bib with a peter pan collar to pair with this sweet fabric, adding a touch of cotton lace and a vintage button. This fabric makes everything extra sweet! Just a dash of velcro to add and these sweeties will be ready for gift giving. I’m finishing up a pattern for these bibs, so if you’re interested in making your own – stay tuned! In the meantime, there’s a little surprise waiting for you below. If you’d like to create bunny-size love notes for that special little somebunny in your life, I’ve linked a download for you to enjoy. A blank mini card, envelope and liner can be cut out by hand and assembled using my printable pdf, and I’ve also included a png print and cut file, compatible with most cutting machine software, to help make the cutting easy-peasy. Grab your pinking shears to create the stamps and save those teeny scraps for the bunny aprons! I hope the cards bring some extra joy to you this spring. Download the pdf to print and cut by hand here. Download the png print and cut file for your cutting machine here. See below for instructions on how to print and cut the png file with the Silhouette Cameo. Download the PNG card art file. Open Silhouette Studio software and import the file into your library by going to File > Import to My Library. Go to your library and select the PNG card file and open it. Your page size should be set to 8.5 x 11.” Adjustments can be made by opening the Design Page Settings. Add registration marks to your file by opening the Registration Mark Window, and selecting the correct Style in settings. Rearrange card art, if necessary, to ensure it does not interfere with the registration marks. Send the file to your printer via Silhouette’s “Send to Printer” button. Once printed, load your 8.5 x 11″ printed card art (with the registration marks) into your Silhouette Cameo using the “Load cut mat” option with your print aligned to the left, top of the Silhouette mat. Open your Trace Settings and follow these instructions for tracing the outer edges of the card, liner and envelope. Do not move the art from it’s print position. Once the outer edges of the objects are traced, click your Cut Settings and selecting > Cut Edge. 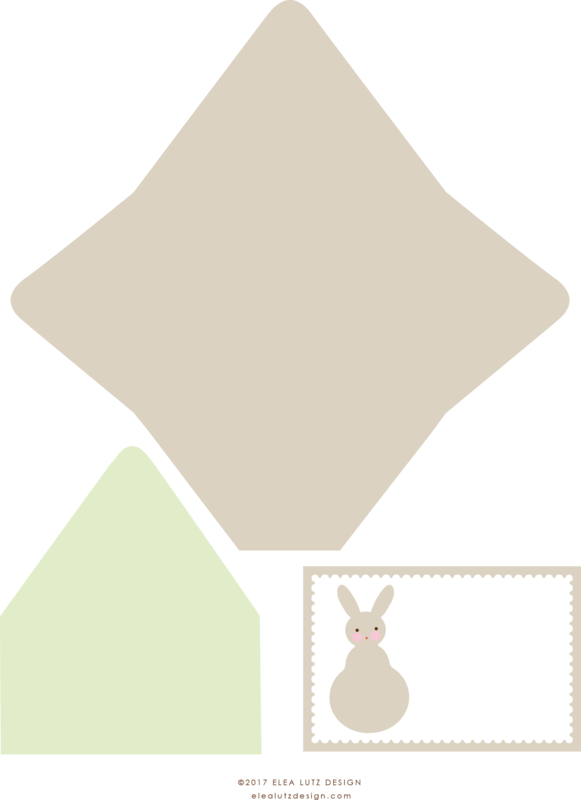 A red outline will show around the objects. This will be your cut lines. Select >Plain Cardstock as material type (or to the material type you printed on) from the Cut Settings and adjust your cutting blade to the recommended settings. When Silhouette is finished, unload the mat and your project is cut and ready to assemble. *Note: To create a fabric envelope liner, use the paper liner template to trace and cut a fabric liner. Option: Press a paper backed fusible to the backside of the liner fabric, then trace around the template with a pencil on the paper side. Cut out the fabric liner along the trace lines (the fusible helps keep the edges from fraying). What beautiful projects!! Love your little house with pockets – what a great idea; and the cute bibs; and the envelopes – all so specially made! Thank you also for the pattern to make a few of our own. This fabric really is pretty and so special! Absolutely the sweetest!! I might just need to make one of those bibs. So sweet! Oh Elea . . . this was a delightful read. So much of YOU can be found in these projects. They are just lovely. Such a sweet gift you have made for your children, and I cannot wait to get your bib pattern. 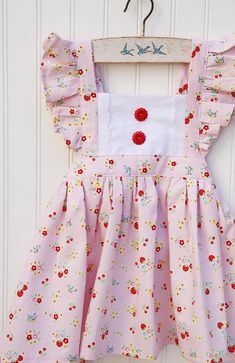 The bibs are just perfect–such details! (You know my children are in college now, but someday I’m sure I will need to be making bibs again!) Well done friend! What a beautiful post! Thank You for sharing all things cute from Wonderland! Just so sweet Elea, ahh peter pan collars we love them don’t we. 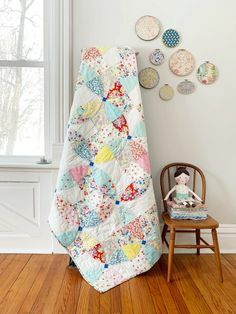 The wall hanging is such a lovely idea little ones do love secret pockets. Oh, Elea!! The bunny house is precious! 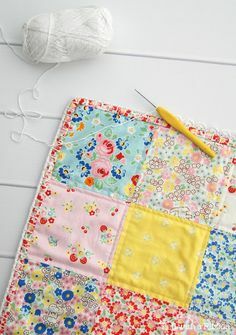 What a perfect make for this fabric! And I just can’t get over the little paper bunnies and their skirts. Oh. my! That wasn’t suppose to say ‘mamm’ lol it was ‘I’m’ hehe. Really adorable, thank you for sharing the cards with us. What a sweet post! Makes me just happy reading it!